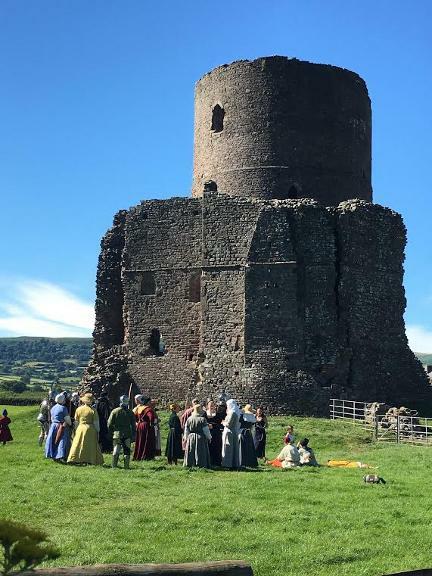 This tour visits 7 castles and 2 medieval houses, both within the Brecon Beacons National Park and in adjacent areas to the east, including a castle which is actually within the modern boundary of England. This makes clear the reason why these castles were constructed -they were built on the English/Welsh border to allow England to conquer and maintain control over Wales. INCLUDES Entrance fees to all Castles! Views on the Blorenge, Sugar Loaf and Skirrid Mountains (which are in the Brecon Beacons National Park) from Raglan Castle. 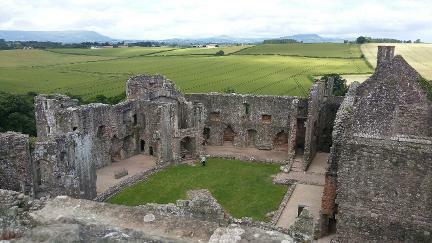 Raglan Castle - We start our tour in one of Wales' most impressive fortresses, considered to be the equal of any other castle in Wales or England. Construction was first started in the 12th century but the present castle dates from between the 15th and 17th centuries. The large hexagonal keep is known as the Great Tower or the Yellow Tower of Gwent. Hen Gwrt Moated Site - We briefly stop at the remains of this moated medieval manor house. 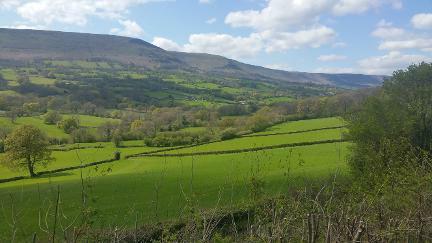 It is reputed to once have been the home of Brecon Beacons nobleman Dafydd Gam who was a direct descent of the Kings of Brycheiniog. He famously died at the Battle of Agincourt fighting for King Henry V. In his lifetime he helped defeat the rebellion of Owain Glyndwr and was at both the Battle of Crecy and the Battle of Poitiers. Gam had a bad leg and his name lends itself to the modern expression a 'gammy leg'. White Castle - White castle is one of 'The Three Castles'. 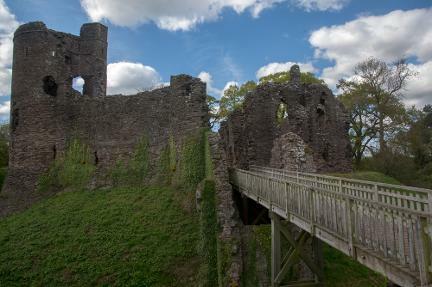 This term collectively describes White Castle, Skenfrith Castle and Grosmont Castle . All three sites have evidence of very early Norman earthworks, possibly made just a few months after the Norman conquest of England in 1066. The earliest castle at White Castle would have been made of wood, with the inner stone castle being built in 1186-7. Grosmont Castle - This is also one of 'The Three Castles' and is in the village of Grosmont which is right on the Welsh / English border. It is generally considered to have been largely built by Hubert de Burgh early in the 13th century, on an earlier Norman foundation, but was extended in the 14th century. Grosmont Castle is believed to have been founded as a wooden motte and bailey castle during, or shortly after, the time that William FitzOsbern was Earl of Hereford, immediately after the Norman conquest of England. Earl William was killed in 1071 and his son Roger was stripped of his lands in 1075. The powerful Marcher Lord Pain fitzJohn acquired Grosmont in the reign of King Henry I (1100–35). In 1142, it was granted to Walter of Hereford, and became part of a single lordship with Skenfrith and White Castle. Although it has been asserted that the stone castle was built at the time of Pain fitzJohn, as the centre or caput of the honour of Grosmont, records indicate that, late in the 12th century, it was probably still a timber construction. Grosmont Castle was abandoned by the 16th century, and, with Skenfrith and White Castle, was sold by the Duchy of Lancaster to the Duke of Beaufort in 1825. In 1902 it was again sold, to the landowner and historian Sir Joseph Bradney, before it passed into state ownership in 1923. 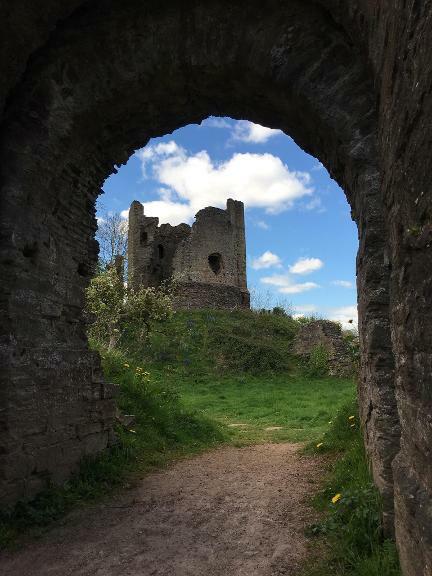 Longtown Castle - Longtown Castle is situated in the Black Mountains, but in a part of that mountain range that lies in the modern English county of Herefordshire. However, at the time the castle was built, this location was in Wales and the modern boundary was only established much later by Henry VIII. The castle was built around 1175 by Hugh de Lacy, possibly reusing former Roman earthworks, the castle had an unusual design with three baileys and two large enclosures to protect the neighbouring town. Early in the next century the castle was rebuilt in stone, with a circular keep erected on the motte and a gatehouse constructed between the inner and outer western baileys. 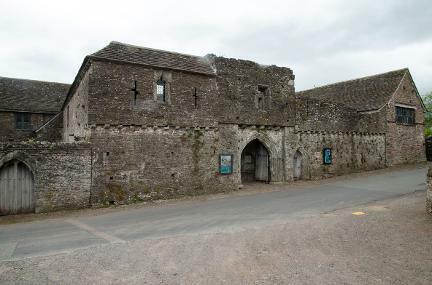 By the 14th century, Longtown Castle had fallen into decline. Despite being pressed back into use during the Owain Glyndŵr rising in 1403, it became ruined. The main reason for the decline of Longtown was the Black Death that killed most of its inhabitants. Tretower Court and Castle - Tretower Castle was built around 1150 as a motte and bailey castle and was enlarged in the early thirteenth century. Tretower Court is a medieval fortified manor house. The Court evolved from the adjacent Tretower Castle site and is a very rare example of its type, in that it shows the way in which a castle gradually developed into another significant type of medieval building, the fortified manor house or defended house. It is also a rare survival, escaping destruction in wars or conflicts, partial damage or slighting, for example during the English Civil War, and total redevelopment over time. The Court was the meeting point from which the local contingent of Welsh archers left for service in France under King Henry V and contributed to the English victory at Agincourt. 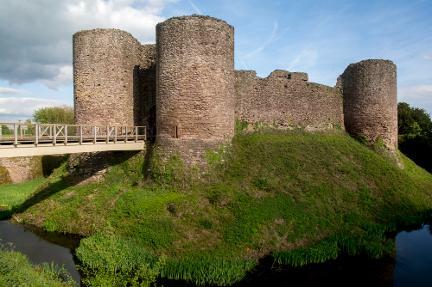 Abergavenny Castle - The castle was established by the Norman lord Hamelin de Balun in about 1087. It was the site of a massacre of Welsh noblemen in 1175, and was attacked during the early 15th century Glyndŵr Rising. William Camden, the 16th century antiquary, said that the castle "has been oftner stain'd with the infamy of treachery, than any other castle in Wales"